It seems that there has always been a lot of confusion about what goes at the “bottom” of your greenhouse. A lot of people use these three terms interchangeably, but this isn’t accurate. Each of these 3 items is a different component of a greenhouse. The greenhouse foundation and base pretty much serve the same purpose. They are used to give a good, strong substructure to place the greenhouse on. They also help tie the greenhouse to the ground. A greenhouse floor is another item all together. It is basically like the floor in your house. A greenhouse foundation will be built much like any foundation that is built for a home, a garage or shed, etc. This will all depend on your location. Many of us have freeze/ thaw cycles that cause the ground to heave and could potentially cause damage to a greenhouse frame and / or covering. To be built properly a foundation must go below your frost line and a footer must be poured or a pier type foundation built with Sonotubes. The Sonotube structure is also sometimes used for decking. They have complete instructions on their website (sonotube.com) if you are not familiar with this type of construction. If you are not sure of the proper level you need to dig down to contact the local building codes department, or possibly a local contractor. This is a good practice for any glass greenhouse, but you can build up to an 8’ x 12’ single glass greenhouse without a foundation. Be sure to build a proper foundation if you are building a double glass greenhouse or a larger single glass greenhouse. Additionally, any polycarbonate greenhouse that is over 12′ x 16′ should have a foundation. 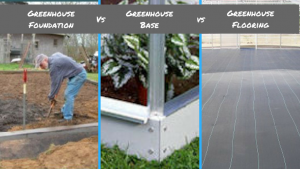 A foundation is also a good idea anytime you are attaching a greenhouse to your home or building, although in some situations a base with smaller polycarbonate kits can be used. These are available with some of the kits on the market today. There are also some polycarbonate greenhouse manufacturers that recommend this method. A greenhouse base will be the same size as the perimeter of the greenhouse. A kit may have a steel base, or you may choose to build your own treated lumber base. It does not come with a floor and in most cases it does not go below ground. The greenhouse is tied to the base and the base is then anchored into the ground. This helps to stabilize the greenhouse and keep it from getting blown over in heavy winds. You can build a base like this for a small single glass greenhouse (up to 8′ x 12′) or for a polycarbonate greenhouse up to 12′ x 16′. With some of the kits it also serves a double function. Some of the kits require this for the doors to open properly. The greenhouse floor is quite simply what you walk on and there are a lot of options available. Some will choose to do a concrete floor. If you are going to do this you must address drainage before pouring the floor. Also, I suggest using a heavy broom finish, as wet concrete can get slippery. A second option is to put ground cover down on a leveled dirt surface. This is a UV protected polypropylene material that is used in some commercial greenhouses. It is the black fabric with green stripes where they have their liners set up and is a heavy, durable material. This type of floor can be enhanced by placing sand or gravel over top of the ground cover. You can also put pavers down the middle for a nice walkway. The possibilities are endless. Some people will choose to actually build their raised beds in the greenhouse. If you are doing this just use the ground cover or concrete between the beds. I have had one customer who built an intricate paver pattern inside the entire greenhouse. This is great because it is beautiful, and it is excellent as far as drainage is concerned. Finding and building the correct greenhouse can require a considerable amount of time and financial investment; be sure to build it properly so it will last a long time. Tammy Wylie is the owner of Advance Greenhouses and has been selling and installing greenhouses since 1993. She currently owns and operates two greenhouses, an 8 x 12 is used to overwinter plants and an 18 x 24 greenhouse is used to start vegetables, herbs and annual flowers. She also tests new products in this greenhouse and evaluates them for efficiency and user friendliness. Visit her website at AdvanceGreenhouses.com.